YouTube provides a way to view your entire comment history but no way of saving these comments. For that purpose we don't need any third party plug-ins or scripts, instead we'll have to make use of Google's Takeout service, and no, Google doesn't run a Pizza franchise on the side. The takeout I'm referring to is a Google service that allows you to download your entire or specific data that they've stored on your use on various Google products, one of them being YouTube. I hope it doesn't come as surprise to you that Google keeps this data "safely" for you in addition to tracking you. 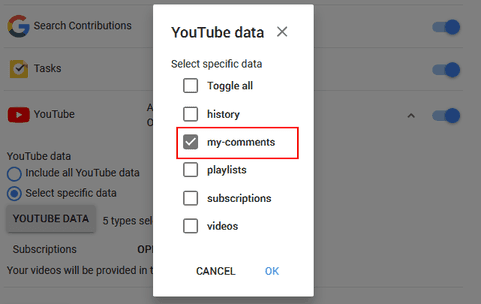 You can get a takeout of your YouTube data and basically this comes as a download containing your YouTube data such as watch history, comments, playlists, likes, uploads, watch laters and subscriptions. In the case of comments, they're neatly packaged in a HTML file you can view on your computer using any browser. This HTML seems to only include comments made when using your default YouTube channel. So if you've multiple channels in your account, comments made as those channels will not be included. 1. Head over to My Account page and sign in to your Google account. 2. On the left under Personal Info & Privacy select Control your Content then click on the Create Archive link. 3. That should open the Google Takeout page with a list of all Google Products. By default all of them will be selected but in our case we only need YouTube. So click on the SELECT NONE button then scroll down and enable YouTube. 4. By default all the aforementioned YouTube data is included for download, including all videos you may have uploaded. Since we only need comments, click on the small arrow on far end and then from the options choose Select Specific Data. That should open a pop up window to toggle your choices. Enable my-comments only then select OK.
5. Now scroll down to the bottom of the page and select the Next button. 6. In the download page you can customize the takeout. For the archive format of the download you get the choice between ZIP or Tar Gzip (*.tgz). ZIP is selected by default. Under Delivery Method you can opt to have the archive exported to your Google Drive, OneDrive or Dropbox instead of downloading it directly. When you're done customizing just click on the CREATE ARCHIVE button. 7. Give it some time to prepare the archive for you and you should get a download link afterwards. Another download link will also be sent to your Gmail's inbox. Click on that link to start your download (as a safety precaution you'll have to sign in to your account again before it can begin). The download will be available for the next seven days should you wish to re-download it. 8. Once you've your download, extract it with your archiving program (or Windows Explorer) and you should get an HTML file (index.html) inside the extracted folder. This HTML file provides a summary of the data you've downloaded. You can view the comments by clicking on the YouTube button which should reveal a link to the my-comments.html. Alternatively, you can just open the HTML file directly from the extracted my-comments folder inside the YouTube folder. If you're on Windows 10, you can use Microsoft's Print to PDF Printer. This virtual printer will work on any browser you're on and the PDF should look decent since this HTML is quite plain looking (no complex elements). If you're using Chrome browser, you can use it's in-built Save as PDF feature by going to the Print page (Ctrl+P). This one is also a virtual PDF printer but it gives you some customization options and from my experience tends to outperform the other one's mentioned here. You can install a free virtual PDF printer program (e.g Bullzip, PDF24, PDFFill etc.) which should allow you to print a webpage to a PDF file from any browser. Last but not least, you can always convert the file online using free online HTML to PDF converters like HTML2PDF.